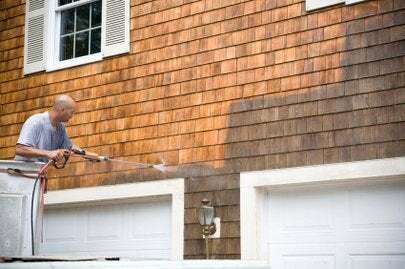 You can get several years’ worth of grime off your deck and siding in minutes with a pressure washer. Whether you buy it or rent it, it’s a great tool to have. But go easy. Pressure washing with more than twelve hundred PSI will strip flaking paint, and it can easily damage your siding. For cleaning, volume is more important than pressure. You want to stand several feet from the house and work from the top down. Use a wide-angle spray nozzle and keep the spray at about 30 degrees from the surface to avoid leaving marks. A narrow nozzle at high pressure at a right angle to the surface will damage your siding… and it can hurt you, too. Always wear safety goggles and protective clothing when you’re pressure washing. Avoid using chlorine bleach; it can turn cedar and redwood black and kill your plants.